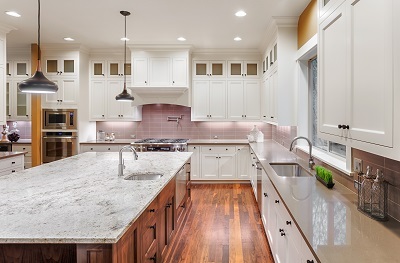 Everything you ever wanted to know about granite countertops. Like many things, people flock to what they see and hear on television. For many years now, granite countertops have been the most popular countertop choice among consumers. Lately, there has been an emergence of other materials such as quartz and marble and slate. Granite has been a mainstay in kitchens for decades now and for good reason. If you choose to outfit your kitchen with granite countertops, you are sure to see the value come back to you when you go to sell your home. Granite has yet to depreciate in value, in fact, more often than not, a home with a granite kitchen sells more than one with a different material. Granite offers a one-of-a-kind look that makes it a unique visual point in the overall look of your kitchen. Granite also has the benefit of being extremely sanitary, there is never a problem with bacterial contamination. Granite is able to withstand extremely hot temperatures because it is made using a very hot heat process. The low maintenance required to keep granite looking brand new contributes to the popularity of the material. Granite countertops are long lasting, so long in fact, that if you get tired of the color you will have to rip off the entire countertop or learn to live with it. Either way, there is no going back once you decide on the granite you want to use because once the granite is glued down it can be extremely difficult to remove. It can be costly and the cost of labor may burn a hole in your wallet before you know it. Unfortunately, granite is not that durable and could crack when encountered with a heavy object. Custom fabrication is simple and rewarding when you work with Rock Tops Fabrication! We use the latest technology to make sure that your surface is designed, cut, and finished exactly how you envision it. We’ve been in business since 2004, and we have been updating our services to better provide customers with quality products ever since. Rock Tops Fabrication has projects and success stories littered throughout Maryland and D.C. Are you interested in quality, customized, beautiful fabrication? Contact us today! You can reach us at 410-363-4267, or you can email us on our website. If you’re interested in more information about custom fabrication, check out our Twitter and Facebook for updates! This entry was posted on Friday, January 6th, 2017 at 9:37 am. Both comments and pings are currently closed.